No matter the weather, conservation is key. At Wilcox Energy, we care about conserving your home’s energy. Our goal is to guarantee comfort for you and your family without burning too much fuel or energy. So check out these helpful tips found in this article. The average household spends quite a bit annually on energy bills. In fact, the U.S. Department of Energy (DOE) reports $2,000 is the average annual household energy bill. Of this total amount, cooling and heating costs account for up to half of that total. Fortunately, it is possible to save on energy costs by using a programmable thermostat. 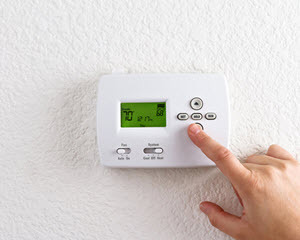 In this article, we will discuss how to use a programmable thermostat and how these thermostat features help reduce your energy costs. Click through to learn more on this topic. If your electricity bill is far too high, drafts could be to blame. Drafts are caused by any gap in your home that allows cold air from outside to enter during the winter, or hot air from outside to enter during the summer. Either scenario forces your heater or air conditioning unit to work harder than it should have to, leading to the possibility of costly malfunctions and maintenance in addition to your bloated power bill. This is obviously a situation you should try to avoid. Click through to read more on this subject.